Red-tailed hawks range from North America to Central America. 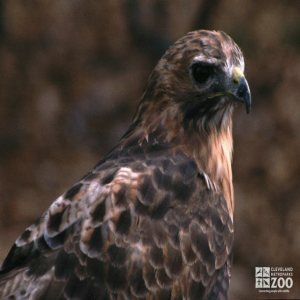 Red-tailed hawks inhabit forests, prairies, deserts, and mountains. Wooded area is required for hunting. Red-tailed hawks incubate eggs from 28 to 32 days. The red-tailed hawk is mainly migratory over the northern part of its range; most winter in the south, but some pairs remain in, or not far from, the nesting range. Pairs cling to the territories year after year. They mate for life or until the death of one of the pair, at which time the survivor takes another mate. They prey mostly upon rodents. Prey is consumed whole, and indigestible fur and bones are regurgitated in the form of a “casting” or “Pellet” about 12-18 hours after ingestion. This is a critical self-cleaning function of the digestive tract, and birds fed incorrectly in captivity soon die. The hawk’s eyesight is described as being 10 times as efficient as a human’s. In courtship the red-tailed hawk soars about, screaming. The smaller male may dive swiftly from a great height at the female, whereupon she may turn over in the air and present her talons to his mock combat. Courtship flights come at any time of the year in good weather, but the breeding season is March to May. Male and female share nest-building duty, and have been known to cooperate in breaking a particularly strong branch. Incubation is mostly by the female, although the male relieves her for short periods and brings food to her while she is on the nest.